FemaleFan » Warriors On Fire With 11th Straight Win, Davis Trade Request Affecting League, Gronk Retiring? Warriors On Fire With 11th Straight Win, Davis Trade Request Affecting League, Gronk Retiring? The Golden State Warriors are on fire, winning their 11th straight game, the longest win streak in the NBA this season, and their 10th straight game on the road. Steph Curry said the team is in “playoff mentality time”. The team is also enjoying their new center, DeMarcus Cousins. Cousins returned to the court on January 18th (after suffering from an extended injury), where he’s immediately adding to the team’s success. Everyone in the NBA is talking about New Orleans Pelicans Anthony Davis requesting a trade and how that could affect the League. In a tweet from Los Angeles Times reporter, Brad Turner, “Hearing from sources if Lakers want Anthony Davis, who has requested a trade, LA has to start the deal with Lonzo Ball, Kyle Kuzma, Ivica Zubac, No. 1 pick.” The NBA trade deadline is February 7th and according to ESPN, the Pelicans don’t have plans to trade Davis unless they receive an “overwhelming package” in exchange. The media is not only focused on whether New England Patriots quarterback Tom Brady will retire after the season (he says zero chance) but also whether Patriots’ tight end Rob Gronkowski will continue to play. 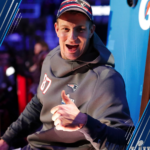 Gronk, who’s always the life of the party, almost retired after the Super Bowl last year. Gronk is an almost certain future Hall of Famer but has suffered from multiple injuries throughout his career, so it’s a big possibility he will move on after the season.